Hair, its length and attractive appearance — were always one of the standards of female beauty. It should be noted that it is long and well-groomed hair has always been an indicator of femininity. This is a unique and indisputable advantage over short hair. But the length of hair is also a matter of taste. Some people like long hair, some don’t. In order to show the beauty of long hair, without exaggeration, we should use a variety of hair weaving techniques. Let’s present some current ways of weaving hair that our beauty salon TV Style offers. The easiest method of hair weaving is plaits of three strands. It’s quite simple. You comb your hair. 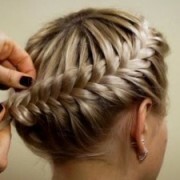 You should do it at the beginning of every weaving plait. First we number the strands: one, two, three, and then we use the following scheme of weaving. The third put between the first, then the first between the second and third, and then the second between the first and third. And continue it until the end of the hair. There are techniques of hair weaving of four and five strands. «The French braid» is one of the techniques of weaving. We make a diagonal parting from the front at an angle of forty-five degrees. We move to the middle of the top and down to the back of the head. Now we weave French braids on both sides of the head. Strands should not be too thin and should not adjoin one another. We put a ribbon under the first strand, leaving approximately 15 cm from the top. In the process of weaving, we pass it through the curls. After these weaves, we pass to a simple plait and connect all the small braids. We put the decorations under each strand. We fix the end of the braid. The next type of plait — is a voluminous braid. We comb hair, gather them in a bunch and start weaving. We weave a row and add additional strand to the inside. Next, you need to change the length of the strands. The right hand – a short end, the left one – a long end. This is for a stronger connection. A hairstyle «Lady’s hat». We comb hair back. We separate small strands from both the right and left sides from parietal area and intertwine them to get the grid. The intertwining can be decorated with beads if desired. Weaving of plait is better to start from the right temple to the left. We fix the braid in the areas of temples. If you desire, you can decorate it with small flowers that give femininity and lightness to the hair. The weaving of plaits can be made at home. But in our beauty salon TV Style — you will be treated individually and you will get what you want. Be always beautiful and well-groomed with us — TV Style. Keep an eye out for the beauty of hair and weave beautiful plaits with us.